At this time of year, during the darkest snow covered months, gardeners are poring over seed catalogues, sorting through their seed inventory, concocting wish lists and colour schemes. Although the garden may lay dormant, the imagination of the gardener is in full bloom. Beds are being reshaped, kitchen gardens sketched and new plant obsessions are just beginning to take hold. For those who follow such matters, the Perennial Plant Association has named Amsonia hubrichtii the 2011 Perennial Plant of the Year™, an honour bestowed upon specimens that are readily available, low maintenance and provide seasonal interest. Although Amsonia may indeed be an admirable addition that can be sketched into any perennial border, my current horticultural obsession has yet to advance beyond the seed kernel. I am spending the winter experimenting with handfuls of a few unusual seed varieties, and out of this seedy winter fest my own choice specimen and the inaugural award winner for Seed of the Year is most certainly Nigella sativa, commonly referred to as black seed. My initial introduction to Nigella was not through the pages of Richters or Burpee, but through my local Ethiopian shopkeeper. "Black seed is best", my grocer declared, as I stood counting my change for a bag of peppercorns one winter evening. I was given a few small, sunflower-shaped, matte-black grains to try. Nigella seeds are spicy and strongly reminiscent of oregano. I was advised to add the seeds to soups, stews, tea or bread, that it was good for the chest, for the cough and cold, and to always keep a handful handy for a strong disposition. And so, I have. 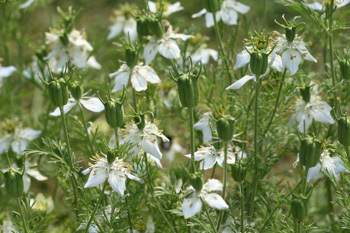 Nigella sativa, native to western Asia, is an annual herb and a member of the buttercup family. Growing to a height of 30-40cm, the leaves are finely cut, like those of fennel, and the flowers occur in either a pale blue or white. A handful of species within the genus have traditionally been used in parts of Asia, North Africa and the Middle East as a spice, medicine, or as pure ornament. 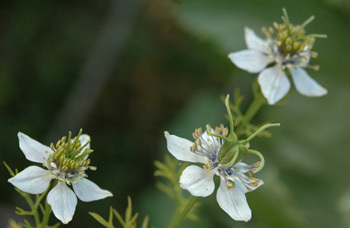 Gardeners may be familiar with Nigella damascena, love-in-the-mist, a highly recommended specimen for cottage gardens. However, it is the seeds of the esteemed N. sativa that possess a distinguished and impressively long history, spanning entire continents and civilizations. The Egyptians considered the seeds as a panacea—they were purportedly found in King Tut's tomb. For the Romans, they served as a culinary seasoning and nutritional supplement. In Dioscorides' De Matria Medica, Nigella sativa is recommended for headaches, toothaches and nasal congestion. And the Prophet Muhammad advised to hold onto black seed for it has a remedy for every illness except death. Like it's New World counterpart, Echinacea purpurea, Nigella sativa found its way into the laboratory and has undergone contemporary therapeutic research. Studies have revealed a host of constituents, including powerful antioxidants, essential amino acids, vitamins and proteins. The most active components span the pharmaceutical repertoire, exhibiting anti-inflammatory, anti-histamine and anti-bacterial properties. In the past decade scientists have initiated increasingly numerous investigations into black seed's effectiveness in the treatment of bronchitis, asthma, allergies, specific strains of bacterial infection, as well as potential applications for cancer therapy. In the food shops of Toronto's Little India Nigella sativa’s history is well respected. Referred to as kalonji, or onion seed, it is a common spice flavouring pickles and Naan bread. One can find bottles of Nigella oil whose label adheres to the herb's medicinal heritage. The accompanying literature lists prescriptions for hair loss, respiratory infections, strengthening of the immune system, digestive ills and skin conditions, such as eczema. Browsing the fully stocked shelves of spices and oils there is food and medicine, virtually indistinct. This year, as I steadily wait out the winter with the comforting spread of catalogues and gardening books jotting down tips and suggestions, I will, on the advice of my local grocer, be sipping warming cups of black seed tea with a touch of honey.